LDSS-3 is an optical imager and (multi-) slit spectrograph on the 6.5m Magellan II (Clay) telescope at Las Campanas Observatory. 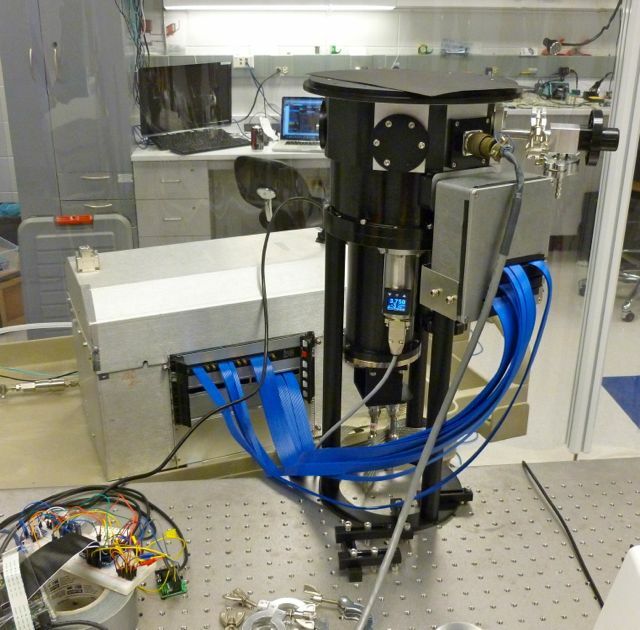 The instrument optics were designed to deliver very high throughput at red optical wavelengths. However, the current detector in the instrument does not take full advantage of this capability because its quantum efficiency falls off dramatically beyond 700 nm. We are currently working to upgrade the LDSS-3 camera with a state-of-the-art red-sensitive CCD. The detector we will use is one of the spare CCDs that were manufactured for the DECam. At 1000 nm, these CCDs have quantum efficiency of 50%, whereas the current LDSS-3 detector has a quantum efficiency of only 5%. The total spectroscopic throughput for LDSS-3 with the new detector as compared to the current detector and to IMACS, which is a similar instrument on Magellan I, is given below in the Figure. In addition to pure efficiency, the new detector will have reduced fringing at red wavelengths compared to the old chip due to its thickness and QE, and it will enable macroscopic nod-and-shuffle. We will build a complete CCD system (housing, dewar, electronics) for the new detector that can be installed in place of the old system. This project will heavily leverage the knowledge and hardware developed for DECam. In particular, we will use the DECam optimized read-out electronics system that delivers only 7 electrons read-noise for a 17 seconds full-frame (2k x 4k), unbinned read. Our motivation for performing this upgrade is to make LDSS-3 more useful for ground-based transit spectroscopy observations. Water vapor is one of the most important diagnostics of the structure and composition of exoplanet atmospheres. The spectral signatures of this molecule are difficult to observe from the ground due to its prevalence in Earth's atmosphere. However, water vapor in exoplanet atmospheres can be observed from the ground in the wavelength range 900 -- 1000 nm because the corresponding telluric features are relatively weak. Transit spectroscopy observations using our multi-object technique are typically photon-limited at the 1e-4 level of precision. Therefore, instrument efficiency, even on large telescopes, is critical for these measurements. LDSS-3 with the new detector will become a powerful instrument for revealing the nature of exoplanet atmospheres. The proposed detector upgrade will also finally realize the original intent of the LDSS-2 to LDSS-3 upgrade project, which was to facilitate galaxy spectroscopy at redshifts beyond z=1. In particular, the upgraded LDSS-3 will become a powerful instrument for observations of early-type galaxies at these redshifts; this will enable research on galaxy clusters in particular. With the current system, the G-band (which usefully defines the red edge of the spectral region which must be observed to robustly deduce absorption-line redshifts in clusters) can easily be observed to about z = 0.92, and the [OII] 3727 Ang doublet to z = 1.22. These redshifts correlate well with the difficulty of observing such galaxies with redshift - currently at z < 0.9 observations are straightforward, at 0.9 < z < 1.2 observations are possible but increasingly difficult, and at z > 1.2 observations rapidly become extremely difficult. The upgraded system will move these performance goalposts to from z = 0.92 to z = 1.35, and from z = 1.22 to z = 1.72, opening up a critical portion of redshift space that is currently difficult to address. This will be true whether the targets are cluster galaxies, or a more general population. Also, note that LDSS-3 has been used extensively for single-object longslit spectroscopy of transients - both GRBs and supernovae. In particular, for the most distant GRBs this will move the observable redshift limit of high-z GRB dropouts to z = 6.7 from z = 5.3, where we have defined the limit using the wavelength of Ly-alpha + 100 Ang as a fiducial; similar improvements are of course realized for any ultra-distant galaxy spectroscopy as well. A critical task for the Dark Energy Survey soon to start at the CTIO 4m will be the spectral typing of at least a subset of distant SNe. The most useful distinguishing feature is the SiII line seen in type Ia SNe. Robust identification of this feature requires rest frame spectra to approximately 4300 Ang. The improvement from this upgrade is thus very similar to the improvement above for absorption line galaxy studies: the redshift region where this is straightforward moves from z < 0.9 to z < 1.35 with the new detector.